Every time I think about the subject, or see a blog post, or article, or discussion about it I immediately become EXTREMELY anxious! Like an I-can’t-breathe kind of anxious. Folks within the autism community are STILL “picking sides”. I generally make a run for the hills to avoid any possible confrontation with it. I feel as if I could easily hyperventilate just trying to write this post. A year ago, I wrote this. And here we are again. It’s April. Autism Awareness Month. Sadly, what I wrote last year still feels very true to me today. I’m disappointed. It makes me anxious and sad and tired. I will support Autism Speaks, the Autism Society , Asperger Syndrome and High Functioning Autism Association (ASHA), the National Autism Association, LifeSkills/TouchPoint Autism Services, and many other autism organizations. I want to support and promote ANY and ALL of the wide SPECTRUM of organizations and individuals that are working positively toward helping ALL others in this great big, and very diverse, spectrum of AUTISM. We need awareness at all levels of autism so we can promote compassion and understanding for ALL on the autism spectrum, no matter where on this spectrum they may be! It hurts my heart to think that some in our “community” still can’t see that. Perhaps I should be glad that I don’t get the hate. I’ve got no room in my life or in my heart for more negativity and bitterness. April is Autism Awareness Month and I know that most of my readers are highly aware of autism every damn day, as am I. In 2012 I followed up my post linked above with this post. And this too still rings true. Positively so. Because of all of this I’ve decided that I want to use this month of awareness to CELEBRATE autism. I will celebrate my son, his differences, his challenges, and the amazing progress he continues to make! I will celebrate our educators, counselors, therapists and physicians who help support and encourage us along the way! I will celebrate our whole family for rising up and overcoming the challenges that autism often brings into our lives. In doing this perhaps others, both within the autism community and those outside of it, will learn by our POSITIVE example. And really, isn’t this what we want to accomplish all year long?!?! Welcome to April! Celebrating Autism Month! 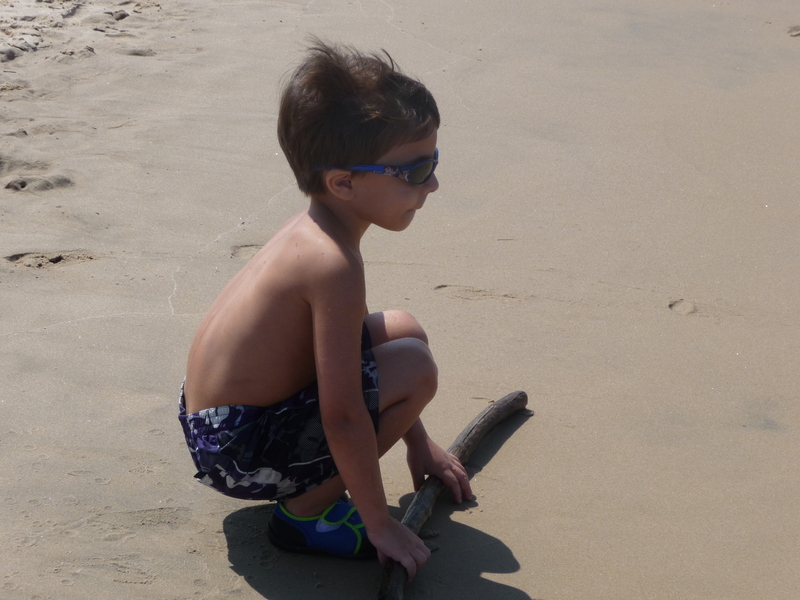 My son was diagnosed with PDD-NOS and ADHD at the age of 4. This was a year and a half ago. I had suspected something was different about my little dude since he was about 2 years old, but that didn’t make hearing the words from a medical professional any easier. A part of me felt a moment of relief to finally have an explanation for all of the struggles we had been going through up to that time. A “yes!” moment. Then suddenly I felt as if I couldn’t breathe. It was as if I had been yanked down under the water. It was real for me. Something physical. It was as if I was suspended in the water just below the surface. I could see but everything looked like I was peering through murky water. I could hear what the pediatrician was saying to me but he was muffled somehow. From that moment I associated the Autism Spectrum as fluid, always moving, always changing and all around me. A watery, living thing, this Spectrum. I remember having to concentrate to breathe and struggling to try to grasp what the doctor was saying to me. My husband, Grant, was off literally chasing our son through the medical building because Henry just could not take being cooped up in the exam room any longer. So I was left there to try to take it all in and remember so I could share with Grant later. Our doctor was giving me literature on Autism and ADHD, a brochure for a local autism service, a business card for an agency for O.T., speech, and sensory integration therapy. I remember talking briefly about ADHD medications and do we medicate or not medicate? He wanted us to make an appointment in a month without Henry so we could discuss how he’s doing and to talk more in-depth about medication options or the option of no medications. He wanted to talk to us without distractions. He had experienced parents like me before. He knew I was probably barely retaining a fourth of what he was really saying. I realized even then that this was the doctor for us! We adore him! The continual crash of the waves can be too much some days. On these days I am physically tired from it all. But again, what choice do I have but to reach for my board and try to learn to surf those waves of the Spectrum? To own them. To make them ours. 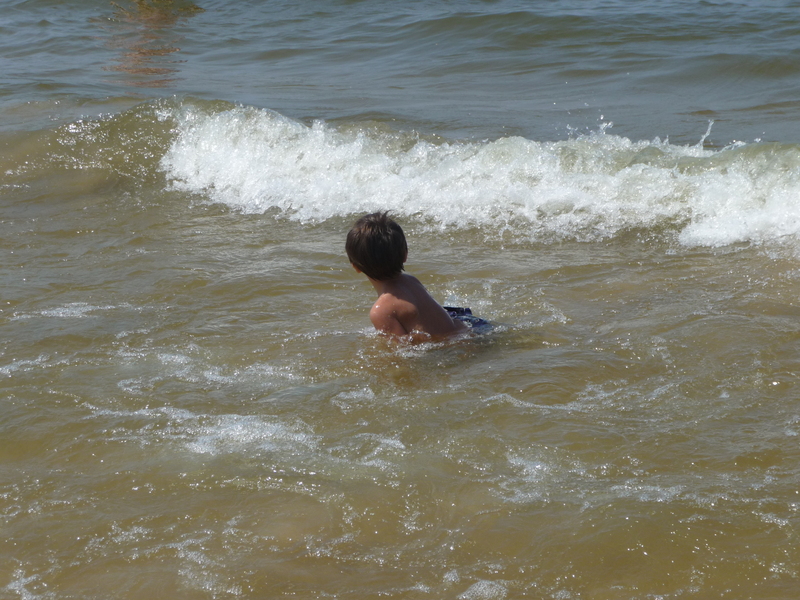 Surfs up, my little dude! Kindergarten Transition IEP. These three words have been ominously rattling, clanking, whispering and shouting in my brain for weeks like some surreal dream sequence from an old Twilight Zone episode. Curse you Rod Serling! So much information, data and lingo is tossed around. So many people at this one….the outgoing team who we LOVE and our soon-to-be new team who we have never met! Teachers, coordinators, therapists, administrators! That in itself is enough to stir up nightmares! An IEP meeting is truly a strange world in a Twilight Zone of its own. Now that finally the day is almost here, 44 hours and 30 minutes to be exact as I type this line. I’m getting even more panicky. I am anxious about things going smoothly, of getting the services and support my son needs for the big jump into mainstream kindergarten. I want to start off at this new school with this new team on the right foot. That can make all of the difference! Am I prepared? I should be but I certainly don’t feel like it. I am finding it so hard to prepare for the unknown! Thoughts and worries are swirling vortexes in my head. I have no idea how this new team executes an IEP meeting. I really don’t have any idea what to expect! What am I forgetting? Have I left something important out of my notes? Am I missing key issues that need to be addressed? Where are my notes? I still have to finish the collage of my son I am putting together for the new team. I feel such pressure to find just the right photos so they can really SEE my little dude. So they can see how smart and funny and GOOD he is. It is so important that they can see his potential so as to help him to realize it. I have less than 2 days to get focused, get over my anxiety and get on with it. It will be what it will be. For now, my eye is on the short-term prize of just making it through the meeting and then off lunch at a nice restaurant for my favorite lobster ravioli and a glass of wine (or two!) with my husband! By this point I have to think that all will have gone well and we will have navigated through the Twilight Zone. And we are not inviting Mr. Serling to lunch with us!